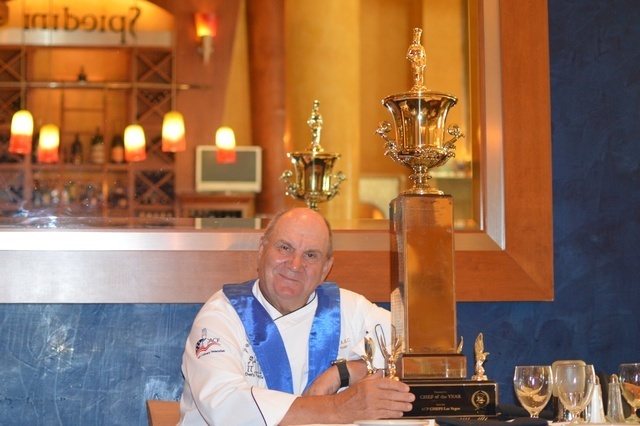 It’s taken almost 30 years but the American Culinary Association has finally honored Chef Gustav Mauler as its Chef of the Year. Chef Gustav trained at a culinary school in Vienna and traveled the world before coming to the United States. He’s prepared meals on four continents — Africa, Asia, Europe, and North America. He opened the Golden Nugget in Atlantic City and afterward Steve Wynn brought him to Las Vegas in 1987. Chef Gustav’s accomplishments include developing and opening the kitchens for the Mirage, Treasure Island, and Bellagio. At Mirage and Treasure Island, he served as vice president of food and beverage. 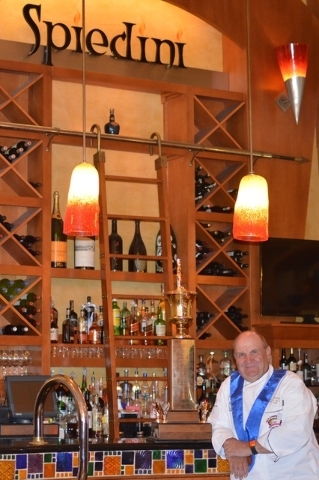 He opened Spiedini’s in 1999 in conjunction with the Summerlin Marriott opening. Q. What is the most challenging aspect of being a chef in Las Vegas where things are always changing? A. That’s challenging and also exciting. I’m one of these people who’s always reads up on the new thing. The healthy cooking, all the special things, the vegan, the this and that, whatever it is. It’s a fact of life now. It used to be a fad. But now I have a lot of customers. You get this all the time. It’s gluten free; it’s all kinds of stuff happening every day. And it’s an exciting thing to learn about because it’s part of us. Chefs, we can help human kind if we could find the right way. Not everything is fried. There’s a healthy way of doing stuff. The fresh produce and the fresh fishes and the fresh things; fresh is better. Q. Why is staying informed of current trends important? A. Because it’s exciting and because customers want to learn about things now. When I play golf, most questions aren’t about golf. My friends are asking me how to cook this, how do I make this, what do I do with this. I always give them tips because it’s easy to me because I just love to do it. I always read up on the new things, because, again, we are what we eat. We know we should exercise; we know we should eat right, in order to have a longer life and stay healthy. We need to reflect this in our menus, reflect this in the way we do things. I think it’s no longer an unknown, what it takes for us to be a healthier human being. Q. Why is service an important key to success? A. I was really fortunate when I did my apprenticeship. I did a double apprenticeship in service and in kitchen art. It’s like here you don’t have to go to school for service; in Europe you go school to learn all the aspects, carving, flambéing, etc. Taking care of customers (is) the most important thing. Going back to Austria, the gross national product is driven by tourism. So we had to be ambassadors in these restaurants. Tell the people ‘just across from this restaurant is this famous building built by xyz’ and so on. It has always been a part of touching the customers, and being with them, and explaining to them, and this made me also work with my service staff and my team because owning your own business in a difficult thing. The economy hits, things are happening, 20-30 new restaurants are opening around you. You have to make sure we do a good job because there’s such a huge (number of) things for customers to go to. We’ve got to give people an excuse to come back. The feeling of service is the most wonderful feeling. Q. What is the biggest faux pas you see in the industry? A. It drives me crazy when I’m at a restaurant and I say “could I have this” and they say ‘No’. You get this a lot. And my thing, with my staff, my people, is “anything I can do for you” because we want to make you feel good. We make things fresh; so, why not cook it the way you want it. I’m going to make this dish for you the way you like it. Q. What’s the key to keeping customers coming back? A. People are surprised how accommodating we are and how knowledgeable, because I always read up on things, I want to make sure we are up to date with the newest things. It’s a great thing when you get something straight from a farmer and then you make something out of it. That is an important thing. To make the people understand, we don’t have a job if we don’t take care of you, the customer. Q. What was it like to win Chef of the Year? A. I’ve been here many years. I’ve been nominated a few times but I’ve never been picked as Chef of the Year. So, this year, I was really honored when the board of directors and everybody unanimously picked me to be the Chef of the Year. Q. Why is it important for you to be active in the community? A. This is the future for us. When we teach the young kids, when we see these kids coming in and we tell them ‘this is a great job you did here, to improve you have to do this.’ And to be positive with the people, it’s a very difficult job. Now, if you beat on them — ‘you didn’t do this right’ and ‘you didn’t do this right’ — you take their spirit away, you take the exciting parts away. When you see these young people, 18-19, their whole life is out there and you see the sparkle and they want to be a chef. I love to help them. I love to do things for them.